Game Mechanic Idea based on Interesting Neanderthal Theory - "Them + Us"
While browsing the Internet, I came across an interesting theory regarding Neanderthals and their relationship (both genetic and behavioral) with early humans. Before I go into detail, I'd like to point out that this stuff is VERY theoretical (but is actually pretty cool). Anyway, I think we've all seen some kind of depiction of a Neanderthal by now. Pretty human-looking, just a bit stockier, with a longer face and domed head. In more scenic depictions, you see them trundling through the glacial Ice Age lands, clad in thick furs and brandishing spears. You may have also read or heard some musings on their relationship with humans; preserved campsites have been found in the same regions, while genetic evidence hints at at least some interbreeding between both species. Then this "Vendramini" guy thinks about it all. For starters, the absence of sewing tools at Neanderthal campsites (compared to such being found at human campsites) implies that Neanderthal clothing can't have been that sophisticated. For another, reconstructions of Neanderthals tend to employ identical methods to reconstructing human remains. While this is all well and good when one considers our ancestral ties, Vendramini couldn't ignore how distinctly apelike Neanderthal anatomy happened to be, such as the shape of their skulls (also consider their large, elevated eyes) and feet. That thing does not look friendly. Doesn't look like something that'd live in the snow, either. At least, not during the day. Maybe those nocturnal traits were a good call? To put a long story short, humans looking to make their way out of the Middle East and into the Eurasian landmass would be right on Neanderthal turf (assuming Neanderthals didn't make their way even further south). Most interlopers were eaten, while the survivors underwent drastic change that finalized their transition into modern humans. Cool idea, huh? Imagine playing Thrive, and being at the cusp of the Awakening Stage, when you wind up facing a "final challenge" in the form of a relative of yours that chose brawn over brain, and certainly isn't a vegetarian. This forces you into carefully planning a few decisive editor sessions to avert extinction while your population takes a dive (while still working towards sapience as a "check mate"). Or entering the Awakening Stage, only to realize that Auto-Evo felt like being a jerk (like last time), and you're forced to reach the Society Stage ASAP before your inability to evolve further does you in. No offence, but this theory is complete Belgium, for reasons I'll try and explain below. 1. Cat-pupils are scary, but there's no evidence for them whatsoever (this feature isn't found anywhere outside of bushbabies and such when it comes to primates). Early in the video, Vendramini chides scientifically-grounded reconstructions for not being based on fossil evidence, since things like skin, hair, and eyes do not fossilise. Yet he reconstructs Neanderthal eyes in a far less plausible manner than scientists do. A. The orientation is all wrong. Vendramini has the location of the chimp spine jutting out of the back of the Neanderthal's occiput- the back of the head is buried in the neck. Furthermore where the actual Neanderthal spine should attach to the skull, is the location of the chimp's windpipe. This is an incredibly wrong orientation- horribly incorrect. It's like screwing the tire of a car onto the passenger-side dashboard and concluding that it's located where it should be. B. Vendramini forgot to put a jaw on the skull. Not quite helpful claiming a "perfect fit" when part of the skull is entirely absent from your image. C. The ears would be roughly located on the chimp's throat if this orientation was correct- again, a product of the horrible mangling of anatomy. D. It is far from a "perfect fit" as Vendramini claims- yes, the areas do, very roughly, link up, but so would parts of a human skull if a similar 'experiment' were performed. E. It is no new trick- a similar superposition, of black people's skulls over a chimp silhouette, was used to "prove" the racial inferiority of Africans. 3. Vendramini claims for Neanderthals with flat noses, rather than human-like projected ones. However, Neanderthal skulls have a larger bony nasal projection than human skulls do. Which would imply that they had even more projected, or larger, noses, than we do. A. Comparing an organism with another organism in an entirely different genus, from which it has been seperated for millions of years? B. Comparing an organism with another organism in the same species, which it is known to posses several morphological similarities to, and is only seperated from by a few hundred thousand years? I don't know, but I think it would make sense to compare Neanderthals with their closest living relative. 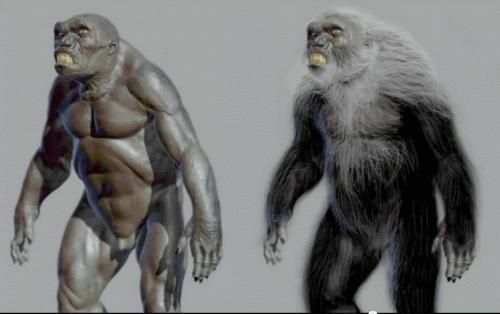 Even if they did have key differences to us- in things like hirsuteness or skin texture- odds are, they looked fairly similar. 5. Vendramini then colours his Neanderthals black. 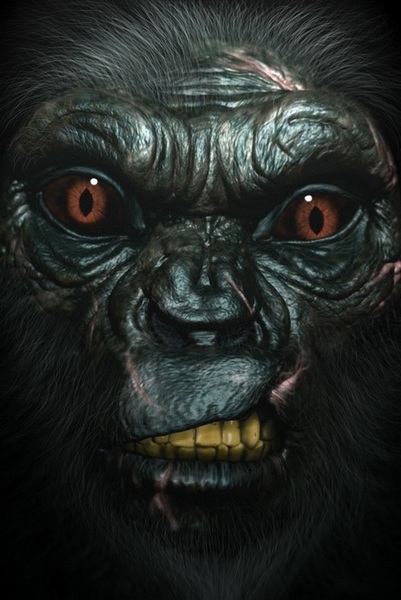 Of course, it's fine to have black-skinned 'primitive' humans, when they're carno-gorillas- and when they're monsters. Needless to say, there is a very wide range of skin colouration that could have been possible for them (even nonhuman apes have striking variation in skin colour- there are a lot of beige, etc, chimps). Living at the latitude that they did, it seems highly unlikely that they would have had such dark skin. 7. Vendramini is no scientist- he is a TV/Film Writer, Director, and Producer (see here www.imdb.com/name/nm0892961/). 8. Vendramini claims that Neanderthal predation pressure essentially drove humans to sapience. He argues that "Neanderthal predation" occured in the area of the Medeterranean Levant. Considering that humans arose in Africa, and that humans with Neanderthal DNA (evidence of Neanderthal-human interaction, or in these terms, "Neanderthal predation", occuring) are found everywhere outside of Africa, what are the ramifications of this, exactly? It does not seem like humans from the Levant region re-colonised Africa and wiped out their pre-contact relatives. So if Neanderthals drove humans to sapience, and Africans didn't have contact with Neanderthals- are black people not sapient!? Nice response (apart from the race stuff... grazes Rule 6 a little). You don't need to say "no offense," though, since I made this thread BECAUSE his theory's got more fiction than fact to it. Sounds like something in a video game; in other words, a fun scenario in a Thrive playthrough. 1. Respect other members. Any offensive language or posts, whether literal or implicit, is prohibited. Think about what you write before you post it. 2. Keep off-topic posts to a minimum and remember the original creator of the thread's intention. 3. Do not harass members about the spelling and grammar of their posts; many members do not speak English as a first language. 4. On the flip side, please put your best effort into making sure posts have good grammar, spelling and presentation to avoid confusion. However, we understand that this is difficult for some. 5. Do not advertise without permission from a moderator, admin or developer. This includes links and promotions of things such as private businesses and the like. If you are unsure whether your link counts or not, just ask. We usually allow links to things that are related to Thrive. 6. Do not spam. Spam counts as short, rapid, pointless posts. 7. Necro-posting is allowed as long as it is relevant and the poster understands that the contributors to the thread before may no longer be around to reply and the interest may have dissipated. 8. Do not double post unless you have a good reason. 9. Do not avoid bans by creating a new account. 10. Please obey the word of the moderators, admins and developers. Did you mean rule 1? Anyway, we're gonna let it slide since Vailnoff was just pointing out the flaws in Mr. Vendramini's argument. Did you mean rule 1?. Weird... Could've sworn there was a "no politics" rule. I think the Discord has one such rule. But you're not on the Discord right? Nonetheless, we might be taking another look at the Forum rules. EDIT: Turns out I posted an outdated set of rules, mitobox . 10. Thrive is not the place for political discussions of the real world. If you absolutely must have a political debate, do it via private message. Here's the rule you were referring to. What do you mean "Race stuff"? Do you mean "racist" stuff? There was none of that, unless you consider human species as a "Race" and were referring to that. Jokes on you, cause you brought up the "race stuff" in your OP. Also, I don't get how politics are involved? Why bring forum rules in to back up your claims that are directed at no one? I think we need to respect what valinoff said there. He soundly disproved your's/Vendramini's claims. He said no offense and there's no need to bring it up again. That's the point of "no offense"
You didn't need to bring this back up again frogonunicycle. (Man, your name is hard to type when you're tired.) Motobox's query was answered and sorted. No one else add to this issue or I'll delete the message. Either go back to the main topic or don't post at all. Motobox's query was answered and sorted. No one else add to this issue or I'll delete the message. Either go back to the main topic or don't post at all. Is it OK if I try to address a small misunderstanding (which I believe will cool things down some)? Why bring forum rules in to back up your claims that are directed at no one? I think we need to respect what valinoff said there. He soundly disproved your's/Vendramini's claims. He said no offense and there's no need to bring it up again. That's the point of "no offense." Well, valinoff made excellent points, although I must restate that I never did claim Vendramini's points as my own. My only problem with them is that he seemed to read too far into it; this thread is meant to be fairly fun and somewhat Thrive-centric (that's why I noted that the Neanderthals look a bit like Ewoks). I do agree that Vendramini did not think things through deeply, but accusing him of racism (when I find it far more likely that Vendramini (who seems to be the "pro-scaly dinosaurs" kind of guy) was just oblivious to the implications) is a big leap. The only reason I brought up Vendramini's theory is that it sounded like something that would be fun in Thrive; a powerful related species would be a fun challenge to tango with. As gamers, don't we all appreciate a challenge? I do! Challenges are my jam. However, considering it was in the Science section, I did think it was a legitimate theory. Perhaps you could further clarify it wasn't as serious as some thought it to be? I didn't think it'd fit in the "Not Thrive" board (given that I intended for the thread to be somewhat Thrive-relevant), and since some other person's idea was the "backbone" of the thread (therefore making it difficult to place in "Future Game," since the idea wouldn't really be my own), I figured the "Science" board would be the best fit. EDIT: Come to think of it, that'd explain everything else. "Huh, why's everyone so angry all of a sudden?" Original ideas aren't the only things that can go in "Future Game." If you see something you think would make for a cool mechanic in the final game, I suggest posting it in that section. As a matter of fact, would you mind if I moved this thread over there now?